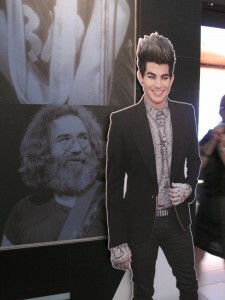 You are here: Home / Spoofs and Humor / Flat Addy / Flat Addy Friday: Adam Lambert Visits With Rock Legends! Adam Lambert has formed important and what must be personally gratifying relationships with some of the most iconic names in rock music. I’m sure his new music will reflect his exposure to these gifted writers. Just thinking about the time he spends with Brian May and Roger Taylor of Queen leaves me breathless! He has already collaborated with many, including Nile Rodgers and now Avicii. So Lila and I thought Flat Addy might enjoy some similar exposure! Look who Flat Addy found to visit with. Can you recognize these icons? We’ve all heard about Lambert family time enjoyed in their Rancho Penasquitos pool, listening to artists like The Grateful Dead. 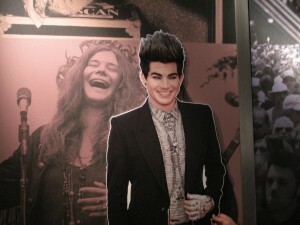 We think Eber and Leila’s tastes have rubbed off on Flat Addy too! These are easy! Jerry Garcia of The Grateful Dead, Janis Joplin and Jim Morrison of The Doors. They may get tougher as this series progresses! LOL! Adam, You are just so fine! 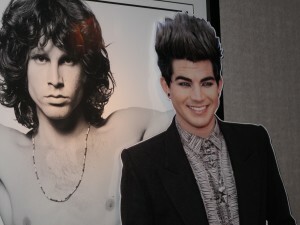 And with the Lizard King ” Jim Morrison.” He was so hot. But he had a lot of issues. I always hope our boy Adam does good. Luv you Adam! I just want a Queen tour squeezed in with recording a new album, singing on Glee, mentoring once or more on IDOL and squeezing in some dates with Niles, Avicii, your own tour……I don’t ask much. My entertainment fantasy involves Adam reviving the whole music/variety show franchise, only making it cooler. I’d love to see Adam collaborating with visiting singers and bands each week, political satire and news offered up via the Gregory Brothers. Probably not many of you out there old enough to remember That Was The Week That Was and the Smothers Brothers, but they were great, pretty edgy for their day and changed how people thought about a lot of things. now lets hope people learn to appreciate good music, theres not much of it out there !